Summer is in full swing and we’re all looking forward to some fun in the sun. But this season also brings an array of hair problems. Straight or Curly, it can be challenging to beat the summer heat and bad hair days. Fortunately, The Makeup Examiner scored some rockin’ tips from Celebrity Hairstylist Bill Murphy. Bill is also the creator of Recitals Hair Care and offers easy tips for looking amazing while enjoying the best of beach weather! 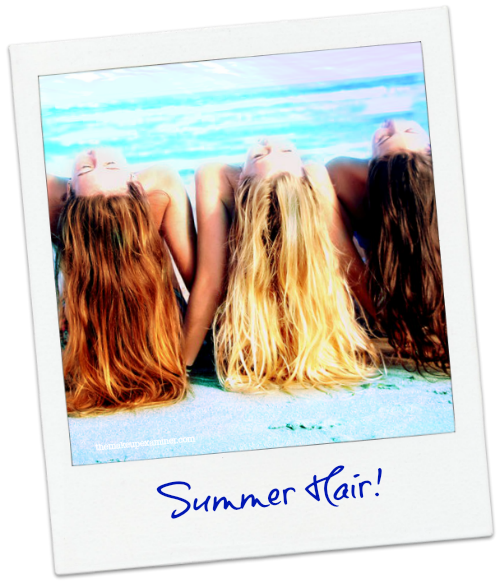 “Hair dries faster during the summer than any other season. The combination of wind and humidity additionally causes frizz and renders hair brittle. The trick is to keep hair moisturized,” shares Bill. Recitals’ latest product Melody Moisture Miracle Crème ($31), which The Makeup Examiner has had the privilege of testing out, is a multi-purpose product that acts as a leave-in conditioner, styling product, shaving cream and even an overall body moisturizer. Yep, an awesome multi-purpose product for summer! Formulated for all hair types from organic ingredients and botanicals, this wonder product goes deep into the hair shaft, and skin as well , for the ultimate in hydration. TME cautions that a little goes a long way, as she ruefully found out the first time that she used MelodyMoisture Miracle Crème as a leave-in. Sunburned Scalp: Oh, like that’s never happened to you? Prolonged exposure to the sun can often result in sunburned scalp. An easy remedy for tender or dry/flaky scalps or even limp hair due to product build up is use cucumbers. Slice a cucumber in quarters and rub gently on your scalp. This will effectively sooth the scalp, moisturize dry scalp and eliminate product build up. Color Fade: If you decided to spend time poolside, remember that this may leave hair color looking unnaturally brassy because of chlorine. Hair color fades naturally with every washing but even faster with the harsh detergents in conventional shampoos. Opt for a sulfate and paraben free product like Recitals Symphony Volumizing Shampoo to better maintain your hair color. About Recitals Hair Care – Recitals Hair Care is a line of natural restorative, maintenance and styling products formulated with only the highest grade organic and botanical ingredients without silicones or parabens. Recitals Haircare offers unique blends that seamlessly work in flawless harmony and easily absorbed into the hair shaft to effectively deliver elasticity, firmness, as well as a silky soft, glossy, youthful feel and appearance. Recitals Hair Care products are available online at Recitals.